The short answer is that lots of people lost their homes, their jobs, and their security for the future. The Democrats promised to give them some relief and they didn’t deliver—the public resents that. Since there is only one other party on offer, they chose Republicans. People who feel resentful are not inclined to coolly assimilate the fact that Democrats made things less worse or that Republican free market radicalism cost them their well-being in the first place. The attention span of American voters can be measured in minutes. If nothing else, the GOP has proven that if you are going to fail, fail so spectacularly that the other team can’t fix it in the short run. We now have a health care system that insures thirty million more Americans than were insured before Obama took office, substantial tax cuts for middle-class Americans, a bailout of Wall St. from which the public will make a profit, a massive economic stimulus that saved millions of jobs, and an economy that has grown for the past four quarters. The calamitous job losses that characterized the end of the Bush Administration have ended and corporate profits are again on the rise. But a recent poll shows that by a margin of two-to-one, those most likely to vote believe taxes have increased, the economy has shrunk, and the billions of dollars of bailout money will never be recovered. As usual, Democrats made the mistake of thinking that if they play fair and do a competent job of managing the bureaucracy and the policy apparatus of government, the public will reward them with approval. But the voting public looks at politics as a morality play, not a policy seminar. The optics of bailing out Wall St. and Detroit while ignoring homeowners, small business owners, and construction workers cannot be changed by earnest management. Especially when Democrats themselves have a reputation for being handmaidens of casino capitalism and corporate welfare. Passing much needed health care reform is laudable but its benefits are too long term to affect this burgeoning resentment in the short term. At the close of the Bush Administration I published a book, Reviving the Left, in which I argued four claims: (1) Voters respond to underlying value systems, not policy proposals; (2) conservatism despite its superficial moral appeal is a form of nihilism, (3) managerial, interest group liberalism, because it refuses to articulate a competing value system, is ineffective as a political ideology; and (4) liberalism can be revived only by adopting a grassroots-fueled ethic of care that emphasizes our moral obligations to each other. This election season tends to confirm all four propositions. Obama had to bail out the banks to maintain some semblance of a financial system. Had he shown the same care for homeowners and workers I wouldn’t be writing this today. Can we turn this around? I suppose hope springs eternal. Hope is by nature resistant to evidence but susceptible to vanity. But without hope one has nothing. Posted by Dwight Furrow in Current Events, Dwight Furrow's Posts, Ethics, ethics of care. Cross-posted at Reviving the Left. This latest outbreak of swine flu reminds us of the limits of self-reliance. One of the main themes of Reviving the Left is that central currents in American thought encourage the idea that unbridled self-reliance is a moral virtue. But this is a dangerous idea that continually leaves us vulnerable to potentially catastrophic events such as pandemics. We like to think that our welfare is in our own hands—what happens to us is in the end our own responsibility. This assumption about personal responsibility is so pervasive that it seems written in the DNA of Americans. And it is encouraged by the fact that our dependence on distant others is often hidden from view. Modern marketing and technology is very good at covering up the origins of things—we are seldom forced to think about the anonymous people who grow our food or make our products. So why should we care about inadequate public health resources in foreign countries like Mexico? The news coming out of Mexico explains why. Two weeks after the first known swine flu death, Mexico still hasn’t given medicine to the families of the dead. It hasn’t determined where the outbreak began or how it spread. And while the government urges anyone who feels sick to go to hospitals, feverish people complain ambulance workers are scared to pick them up. A portrait is emerging of a slow and confused response by Mexico to the gathering swine flu epidemic. And that could mean the world is flying blind into a global health storm. It isn’t obvious what we can do about inadequate public health in other countries. (We have our own inadequacies to worry about.) But this is another example, along with global warming, resource depletion, nuclear proliferation, etc., of a problem that requires collective solutions. And collective action requires levels of trust that only a greater willingness to be generous toward others will provide. Whatever the particular solution to public health failures in other countries, that solution will require, from wealthy nations, persistent, wise regard for the vulnerability of others, in part because their vulnerabilities can become ours. This is more evidence that an ethic of care provides better moral guidance than more traditional moral theories. I posted recently on one of the emerging fault-lines of contemporary liberalism. So I guess, in the interests of being fair and balanced, I should write about the fault lines within conservatism as well. Head on over to Reviving the Left for the post. Posted by Dwight Furrow in Dwight Furrow's Posts, Political Philosophy. As some of you know, I have been working on a book for the past few years. 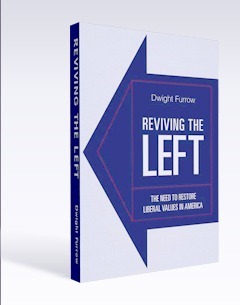 It is entitled Reviving the Left: The Need to Restore Liberal Values in America. The book has just been released. The aim of the book is to describe a new moral vision for liberalism, one that rests less on social contract theory and more on the ethics of care. It is a book of popular philosophy intended for philosophers and non-philosophers alike. Hopefully, a quick but informative read. I have a new website devoted to the book that includes two new blogs—one devoted to liberal theory, values, and politics, and the other devoted to liberal activism (maintained by my son who has considerable activist experience). So head on over and check us out. I will, of course, continue to blog here, but with some of the more political material moving to the new site. With two blogs to feed, when will I sleep? I’m not sure.